To: The Commander in Chief, U. S. Fleet. ACTION REPORT – Action agains enemy aircraft attacing this ship, while on RAdar Picket Sation Number Fifteen, of Okinawa, Nansei Shoto, 11 May 1945. Because of the large number of planes involved, in this extended engagement, the Commanding Officer appointed a Board of Officers to receive statements from key witnesses, verify all reports, prevent duplications and establish the facts of the action in order to assist the Commanding Officer in making an accurate report. On this basis the below report has been submitted. 1. The U.S.S. 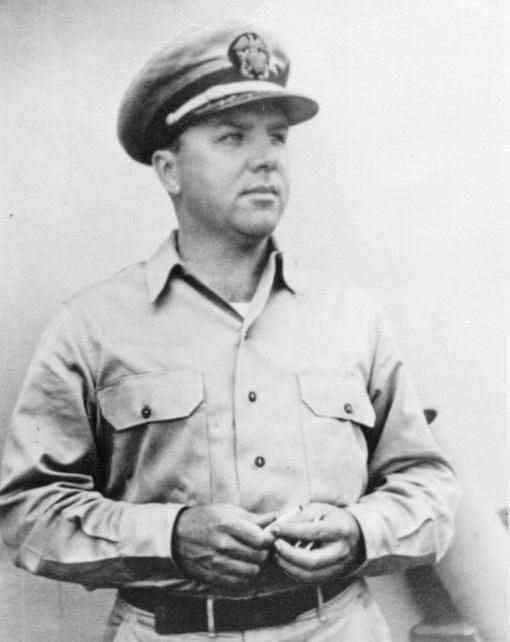 HUGH W. HADLEY (DD774) was assigned duty as RADAR PICKET SHIP AND FIGHTER DIRECTOR SHIP on Station #15 of Okinawa, Nansei Shoto, 10 May 1945. Ships in company were the U.S.S. EVANS (DD552), LCS 82, LCS(L) 83, LCS(L) 84, and LSM(R) 193 as support ships. The Evans turned over duties as Tactical Command to the Hadley. 2. The MISSION of this group of ships was to detect and report approaching enemy aircraft, to control the assigned Combat Air Patrol, and to prevent enemy planes from reaching the transport area at Okinawa. 3. On the night of 10 May, an enemy plane attacked our formation at 1935 and was taken under fire by both. The Evans reported seeing it destroyed. Throughout the night the ship was at General Quarters due to the threatening movements and a few attacks by enemy planes in the immediate vicinity of the formation. 4. On the morning of 11 May, at 0605, the Combat Air Patrol of twelve planes reported on station. At about 0740, bogies were reported to the north-east. At 0745, a large enemy float plane appeared through the mist and was taken under fire by both ships. Soon, this plane headed away from the Evans and came directly for the Hadley which was about one and a half miles from the Evans. This plane was shot down by the Hadley at the range of 1200 yards. .
5. At about 0755, numerous enemy planes were contacted by our instruments as coming towards the ship (and Okinawa) from the north, distance about 55 miles. One division of CAP was ordered out to intercept. Shortly thereafter, several enemy formations were detected, and the entire CAP was ordered out to intercept. Our Fighter Director Officer in CIC has estimated that the total number of enemy planes were 156 coming in at different heights in groups as follows: Raid ONE 36, Raid TWO 50, Raid THREE 2O, Raid FOUR 20 to 30, Raid FIVE 20, Total 156 planes. 6. At about 0755 the entire Combat Air Patrol was ordered out in different formations to intercept and engage the hordes of enemy planes closing us and shortly we received reports from them that they had destroyed twelve planes. Then they were so busy that they could not send us reports but we intercepted their communications to learn about forty to fifty planes were destroyed them. CIC reported that there were no friendly planes within ten miles of this ship. 7. From this time on the Hadley and the Evans were attacked continuously by numerous enemy aircraft coming at us in groups of four to six planes on each ship. During the early period, enemy aircraft were sighted trying to pass our formation headed for Okinawa. These were flying extremely low on both bows and seemingly ignoring us. The Hadley shot down four of these. 8. The tempo of the engagement and the maneuver of the two destroyers at high speed was such as to cause the Hadley and the Evans to be separated by distances as much as two and three miles. This resulted in individual action by both ships. Three times the Hadley suggested to the Evans to close for mutual support and efforts were made to achieve his but each time the attacks prevented the ships from closing each other. The Hadley closed the four small ships several times during the engagement. 9. From 0830 to 0900 the Hadley was attacked by groups of planes coming in on both bows. Twelve enemy planes were shot down by the Hadley’s guns during this period, at times firing all guns in various directions. The Evans which, at this time, was a distance of about three miles to the northward, was seen fighting off a number of planes by herself, several of which were seen to be destroyed. At 0900 the Evans was hit and put out of action. At one time toward the close of the battle friendly planes were closing in to assist us, the four support ships were prevented from shooting down two friendlies whom they they had taken under fire. One plane was seen to splash inside their formation due to their own gunfire. however, I am not able to give an accurate account of their action. They were very helpful in picking up my crew who were in the water, in coming alongside and removing wounded and in helping to pump. 10. From this time on, the Hadley received the bulk of the attacks and action became furious with all guns firing at planes on all sides of the ship. CIC reported that the SUGAR GEORGE radar scope was filled with enemy planes. The Commanding Officer saw that the situation was becoming too much for one ship to handle and he ordered the Combat Air Patrol to close the formation and assist us. With outstanding courage, our planes fearlessly closed the ships and attacked enemy planes. They achieved great results and when the Hadley was finally helpless in the water our crew was sparked with renewed courage by the sight of airmen driving off the remaining enemy aircraft. 11. For 20 minutes, the Hadley fought off the enemy single-handed being separated from the Evans, which was out of action, by three miles and the four small support ships by two miles. Finally, at 0920, ten enemy planes which had surrounded the Hadley, four on the starboard bow under fire by the main battery and machine guns, four on the port bow under fire by the forward machine guns, and two astern under fire by the aft machine guns, attacked the ship simultaneously. All ten planes were destroyed in a remarkable fight and each plane was definitely accounted for. As a result of this attack, the Hadley was: (1) Hit by a bomb aft (2) By a BAKA bomb seen to be released from a low flying BETTY (3) Was struck by a suicide plane aft (4) Hit by a suicide plane in rigging. 12. The ship was badly holed and immediately both engine rooms and one fireroom were flooded and the ship settled down and listed rapidly. All five-inch guns were out of action, a fire was raging aft of number two stack, ammunition was exploding, and the entire ship was engulfed in a thick black smoke which forced the crew to seek safety, some by jumping over the side, others by crowding forward and awaiting orders. The ship was helpless to defend herself and at this time the situation appeared hopeless. The Commanding Officer received reports from the Chief Engineer and the Damage Control Officer which indicated that the main spaces were flooded and that the ship was rapidly developing into a condition which would capsize her. The exploding ammunition and the raging fire appeared to be extremely dangerous. The engineers were securing the forward boilers to prevent them from blowing up. The order to “prepare to abandon Ship” was given and life rafts and floats were put over the side. A party of about fifty men and officers were being organized to make a last fight to save the ship and the remainder of the crew and the wounded were put over into the water. 13. From this point on, a truly amazing, courageous and efficient group of men and officers with utter disregard for their own personal safety approached the explosions and the fire with hoses and for fifteen minutes kept up this work. The torpedoes were jettisoned, weights removed from the starboard side and, finally the fire was extinguished and the list and flooding controlled and the ship was saved. Although the ship was still in an extremely dangerous condition, one fireroom bulkhead held and she was finally towed safely to the IE SHIMA anchorage. 14. The total number of enemy planes destroyed by the Hadley in this period, of one hour and thirty-five minute of continual firing was twenty-three. This number includes twenty shot down to the water and three suicide hits. 15. Our mission was accomplished. The transports at the Okinawa anchorage were saved from attack by one hundred and fifty sixty enemy planes by the action of our ships. We bore the brunt of the enemy action and absorbed what they threw at us. It was a proud day for Destroyer men. The U.S.S. HUGH W. HADLEY (DD774) was OTC of a force consisting of two destroyers, three LCSs and one LSM. In order to achieve maneuverability and concentrated gunfire the following formation was ordered: the four support ships to a diamond formation on a circle one thousand yards in diameter, speed ten knots, reversing course every half hour; the destroyers in a column distance fifteen hundred yards, speed fifteen knots. When attacks commenced both destroyers increased speed to twenty seven knots and maneuvered in vicinity of supports to concentrate gunfire. WEATHER: Wind and sea calm, visibility to the north and east unlimited, visibility to the west cloudy and mist haze. During the attack the force maneuvered to the east and south to get out of the misty haze in order to see the enemy planes more clearly. The haze to the west would not have prevented the enemy planes from seeing us. Communications: Communications were satisfactory in all respects during the battle except that gunfire caused the jacks to pop out of the receiver panel in the radio central feeding radio to CIC. B. The first bomb estimated to be a medium bomb, exploded with considerable flash killing a defense personnel topside aft. 2. The suicide plane hit aft number two stack and plunged to the deck below. There was a tremendous explosion from this crash which result in a raging fire with ammunition exploding. The topside compartments in this area were all completely wrecked. 3. BAKA BOMB this is the bomb which put the ship out of action. It was led in a raging fire with ammunition exploding. It was released from a large lumbering BETTY which came in from astern during the final attack, altitude about 600 feet. The bomb appeared to be about one and one half times as large as a 21″ torpedo. On each side were very short stubby wings about one third the usual wing length of a lane. There was no engine. The bomb struck the ship on the starboard side at frame number 105, which is the bulkhead between forward engine room and after fireroom. The explosion from this bomb terrific and some decks were lifted about twenty inches causing ankles and knees to be broken or strained. Three large engineering spaces were immediately flooded and the ship settled in the water rapidly. Another result of this explosion was to put all equipment including the 5″ guns out of action. A. Damage to our own ship -see Battle Damage Report. ENEMY TACTICS: The enemy planes employed no special tactics except during the final attack to surround the ship and dive simultaneously. OWN TACTICS: The ship was maneuvered at twenty-seven knots constantly using the rudder to present the maximum guns to the enemy. One dive bomber at 0835 was missed by putting hard rudder over when the plane was 1000 yards above us coming in. The stern was swung away from his point of aim and he crashed twenty feet from the ship’s stern. 1. Killed in action twenty-eight; wounded in action sixty-seven; missing in action none. 2. No Captain of a man of war ever had a crew who fought more valiantly against such overwhelming odds. Who can measure the degree of courage of men, who stand up to their guns in the face of diving planes that destroy them? Who can measure the loyalty of a crew who risked death to save the ship from sinking when all seemed lost? I desire to record that the history of our Navy was enhanced on 11 May 1945. I am proud to record that I know no record of a Destroyer’s crew fighting for one hour and thirty five minutes against overwhelming enemy aircraft attacks and destroying twenty three planes. My crew accomplished their mission and displayed outstanding fighting abilities. I am recommending awards for the few men who displayed outstanding bravery above the deeds of their shipmates in separate correspondence. Destroyer men are good men and my officers and crew were good destroyer men..
3. It can be recorded that the aviators who comprised the Combat Air Patrol assigned to the Hadley gave battle to the enemy that rank with the highest traditions of our Navy’s history. When the leader was asked to close and assist us, he replied, “I am out of ammunition but I am sticking with you”. He then proceeded to fly his plane at enemy planes attacking in attempt to head them off. toward the end of the battle, I witnessed one Marine pilot attempting to ride off a suicide plane. This plane hit us but not vitally. I am willing to take my ship to the shores of Japan if I could have these Marines with me. 1. It must be impressed that constant daily drills in damage control using all personnel on the ship and especially those who are not in the regular damage control parties will prove of value when emergencies occur. The various emergency pumps which were on board were used effectively to put out fires. Damage control schools proved their great value and every member of the crew is now praising this training. 2. I was amazed at the performance of the 40 and 20 guns. Contrary to my expectation, those smaller guns shot down the bulk of the enemy planes. Daily the crews had dinned into their minds the following order “LEAD THAT PLANE”. Signs were painted at the gun stations as follows “LEAD THAT PLANE”. It worked, they led and the planes flew right through our projectiles. 3. The Commanding Officer recommends that the torpedoes be removed from ships which are assigned Amphibious and Radar Picket duties. He believes that what is left of the enemy fleet will be taken care of by other Task Forces, or the Air. Replace the heavy weights of torpedo mounts with larger CIC, more RADAR and 40mm gun mounts. In order to function properly, Radar Picket Ships must be loaded with special equipment. In other words, he believes that amphibious ships who are to be assigned to this duty should be specially equipped for this duty and not just generally equipped for regular destroyer duty.